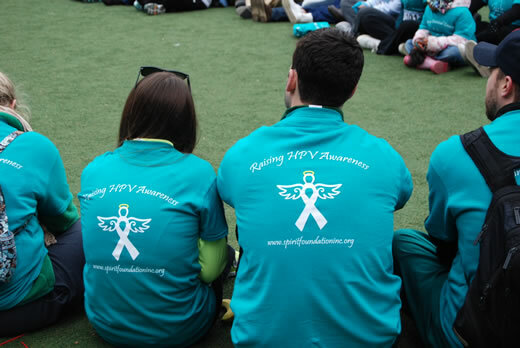 The Spirit Foundation holds an annual "Walk for Hope" to raise awareness and encourage regular screening for HPV-related diseases and cervical cancer among women throughout Georgia. Here, participants at Atlantic Station in Midtown Atlanta. HPV test better at detecting cancer than Pap? Emory's Dr. Kevin Ault talks about a 2011 study. Each day in the United States, 30 women are diagnosed with cervical cancer and 11 women die from it. As Cervical Cancer Awareness Month closes, we are reminded of these sobering statistics. Cancer advocates like Lisa Flowers, MD, and Kevin Ault, MD, from Emory University School of Medicine want all women to hear one simple message - "Routine screenings save lives!" Nearly 100 percent of women diagnosed at the pre-cancer stage of cervical cancer survive. "Over 50 percent of women who present with cervical cancer have never had a Pap or are more than 5 years since their last Pap," says Flowers, associate professor of obstetrics and gynecology at Emory. "No woman has to die from cervical cancer," says Ault, professor of obstetrics and gynecology at Emory. "It’s almost entirely preventable with recommended Pap guidelines. If everyone got a regular Pap test and the HPV (human papillomavirus) vaccine we could reduce the number of women diagnosed with cervical cancer by more than 75 percent." Doctors use the routine Pap smear test to look for pre-cancers or cell changes on the cervix that might become cervical cancer if left untreated. Researchers say the HPV vaccine has the potential to protect women from the disease by targeting the single known cause of cervical cancer - the human papillomavirus (HPV). Two forms of the virus, HPV 16 and HPV 18, account for more than 70 percent of all cervical cancer cases. "As far as a cancer vaccine goes this is the best we have," says Ault, who is one of the lead researchers for the vaccine. "Our hope is that as more girls begin getting the HPV vaccine in accordance with the recommended age guidelines of 9 years of age that protection coupled with screening could potentially eliminate cervical cancer in the United States." And awareness months also provide an opportunity for outreach and education, which Flowers takes advantage of. In addition to her work as an MD at Grady, Flowers is founder of The Spirit Foundation, a non-profit organization dedicated to educating women of diverse backgrounds about preventable diseases and cancers. The Spirit Foundation holds an annual "Walk for Hope" to raise awareness and encourage regular screening for HPV-related diseases and cervical cancer among women throughout Georgia. Though all women are at risk for cervical cancer, it occurs most often in women over age 30. Each year, about 11,000 women in the United States will develop cervical cancer making it the eighth most common type of cancer in American women. "In four or five generations we’ve gone from cervical cancer being the most common cause of cancer death for women in the United States to being a vaccine-preventable disease," says Ault. "That’s a really remarkable story if you trace this research and outreach over the last 50 to 60 years."